« Name this alien fruit! I’m always paranoid that the people outside the stall can see what I’m doing through sliver of space between the door. And I agree that people shouldn’t talk in bathrooms. The echo alone will let the other party know where you are and that’s just TMI. Oh, echoing restrooms are the WORST! Definitely TMI. Great post you got here. I’m still wondering why it’s yet to be Freshly Pressed, seriously! 🙂 I totally agree with all your points; prefer to be ‘quiet’ too. Ah, I wouldn’t hold my breath on the freshly pressed stuff – that’s a whole different league ;-). I’m relieved to hear that men like it quiet too. Hahaha!!! That’s hilarious. These codes should really be published somewhere…like on an employee codes of conduct or something :-). Thanks for stopping by, Sister! Someone once announced that they knew of my presence as they had recognised my shoes under the stall wall. Utter, utter violation! You should have sued. I would. Thanks for stopping by – love your blog by the way :-)! I used to work for a guy who would do computer tech support with a telephone headset on – go in the bathroom while talking to someone, do his business, flush, without missing a beat. OMG! Do people not think about this at all?? I guess if the customer asked, he could just say that he walked past a toilet or that his office is really near the restrooms. But honestly! I’m glad I’ve enlightened you :-). I’m sure you follow them without knowing though…or at least I hope you do :-D! Seriously gruesome! But I guess to be fair, one cannot help when gas is passed….although there’s control over when to pick up the phone! Thanks for stopping by, Kay :-). I refuse to make eye contact with people if/when I go into public washrooms. It’s always so awkward…I feel as though I’m looking into their soul under those neon fluorescent lights. So very awkward. Funny, I often speak to people in the restroom (where I work). Just a casual chat while washing hands. Of course I don’t chat when I’m on the toilet, unless I went in with another person who is also in a stall — then you can exchange a few words w/out discomfort. The thing I hate most is when, in a restroom that has many stalls, I go into one and the next person who comes in goes into the one next to me! I find that astonishing! If someone is already in a stall and I have a choice, I’ll choose a stall as far away from that person as possible. I just don’t know why you’d want to go right next to someone else — the stink, the noise, etc. To me it’s good manners and common sense to stay away, lol! I totally agree with you. The one I really don’t understand are the people yacking on their phones. I would be so embarrassed and, quite frankly annoyed, to find out you were chatting with me in the rest room like that. 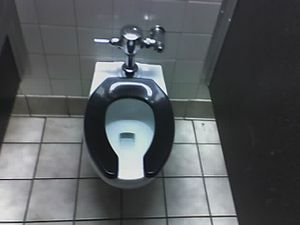 What if someone else flushes? I’m all for just asking if you can call someone back in a few minutes. The world hasn’t gotten so instantaneous and wired that you have to know what happens in the toilet. Thanks for voicing one of my pet peeves. Hehehe! Thanks for stopping by, Chris! This is a really interesting post. It made me laugh because when anyone who would such things like I stretching over the cubicle to say hi must really be psycho. I’m sure I’d collapse in the toilet!